Figure A47. Kalimantan anomaly, interpreted as the Kalimantan slab, with (horizontal) [vertical] cross sections through (A)[D] the UUP07 p-wave) and (B)[D] the combined SL2013 and S40RTS s-wave models at 1190 km; C) the location of the modern geological record that we interpret to have formed during the subduction of the slab. 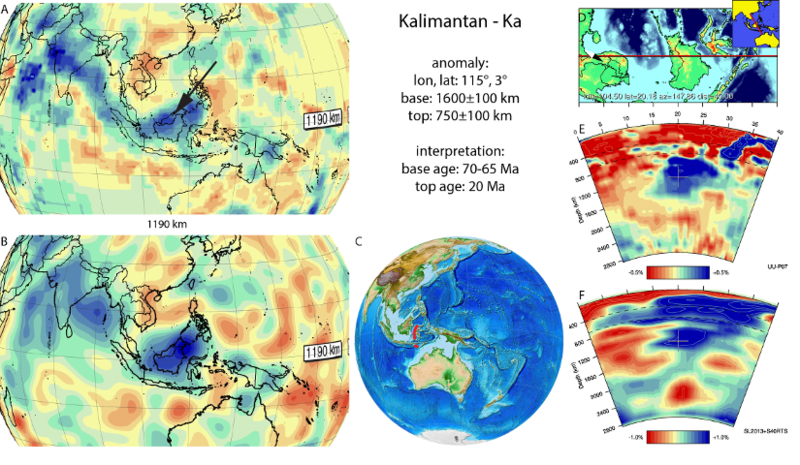 The Kalimantan anomaly (Figure A47) is located below southeast Asia from the middle to the upper part of the lower mantle (Widiyantoro and van der Hilst, 1996a; 1997; Rangin et al., 1999; Replumaz et al., 2004; Hall et al., 2008; Zahirovic et al., 2012; Fukao and Obayashi, 2013). It is frequently interpreted as one single slab together with the Sunda slab. However, the Kalimantan anomaly is not present in the western part of the Sunda slab, where the Sunda slab does not penetrate the upper-lower mantle boundary (Hall and Spakman 2015), and its tip lies just to the south of the Kalimantan anomaly. In addition, the Kalimantan slab is striking NE-SW, whereas the Sunda slab strikes WNW-ESE. This suggests that the Kalimantan anomaly results from a history of subduction north of, and starting earlier than the Sunda slab. Slabs to the east of the Kalimantan anomaly that started to subduct around 55-45 Ma, e.g., Izu-Bonin, Mariana, Arafura, or Caroline Ridge still reside in the upper mantle or penetrated into the top of the lower mantle. The base of the Kalimantan anomaly is thus likely of Late Cretaceous or Paleogene subduction age. Hall (2012) concluded that westward subduction below west Sulawesi, Sumba, and Borneo (i.e. Kalimantan) started ~70-65 Ma, and ended 50-45 Ma, at which time subduction of the Sunda slab started to the south and west. In addition, Hall and Spakman (2015) suggested that the Kalimantan anomaly may host of two separate slabs, whereby the upper part of the anomaly represents subducted proto-South China Sea lithosphere that subducted southeastward beneath North Borneo and the Cagayan arc, now southeast of Palawan, between 45 and 20 Ma. This interpretation was adapted by Wu et al. (2016), where the western part of the anomaly was marked as Proto South China Sea and the east as one of two western East Asian Sea anomalies, subducting between 45-35 Ma and 50-20 Ma respectively. Wu et al. 2016 distinguished another slab in between these anomalies and named it Molucca Sea West, being a continuation of the slab in the upper mantle, with an interpreted start of subduction at 30 Ma. In the UU-P07 model it is not possible to confidently distinguish the boundary between these two or three slabs, and we adopt an age range of subduction of 70-65 to 20 Ma for the composite the Kalimantan slab(s).